Diagram of a typical gas turbine jet engine. English : Diagram of a typical gas turbine jet engine. The native mode of grinding coffee, Palestine. English : The native mode of grinding coffee, Palestine. The Arc de Triomphe stands in the centre of the Place Charles de Gaulle, also known as the Place de l'Étoile (Star Square). It is at the western end of the Champs-Élysées. English : The Arc de Triomphe stands in the centre of the Place Charles de Gaulle, also known as the Place de l'Étoile (Star Square). It is at the western end of the Champs-Élysées. Brown bear (Ursus arctos arctos) running. From Skandinavisk Dyrepark, Denmark. English : Brown bear (Ursus arctos arctos) running. From Skandinavisk Dyrepark, Denmark. A boy playing with a burnt lamp in the city of Birao, Central African Republic. The town was almost completely burnt down in March 2007 during fighting between rebels and government troops. English : A boy playing with a burnt lamp in the city of Birao, Central African Republic. The town was almost completely burnt down in March 2007 during fighting between rebels and government troops. A 4x4 segment panorama of the Colosseum at dusk. English : A 4x4 segment panorama of the Colosseum at dusk. Intercession of Charles Borromeo supported by the Virgin Mary (1714), Ceiling paintings made by Johann Michael Rottmayr (1654-1730) for the Karlskirche, Vienna. English : Intercession of Charles Borromeo supported by the Virgin Mary (1714), Ceiling paintings made by Johann Michael Rottmayr (1654-1730) for the Karlskirche, Vienna. Patti Smith performing at Provinssirock festival, Seinäjoki, Finland. 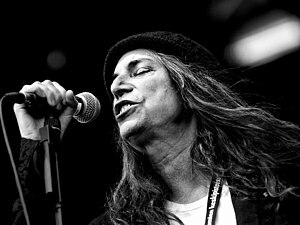 English : Patti Smith performing at Provinssirock festival, Seinäjoki, Finland. Typical Western Australian jarrah picket fence (circa 1930's) with overhanging strelitzia, Fourth Avenue, Mount Lawley, Western Australia. English : Typical Western Australian jarrah picket fence (circa 1930's) with overhanging strelitzia, Fourth Avenue, Mount Lawley, Western Australia. a "Nikon Nikkor AF 50mm/1.8D" lens. English : a "Nikon Nikkor AF 50mm/1.8D" lens. Drawing of an anime character with the name "Mahuri", it combines design elements of Mahoro from Mahoromatic and Haruhi from Suzumiya Haruhi no Yūutsu. English : Drawing of an anime character with the name "Mahuri", it combines design elements of Mahoro from Mahoromatic and Haruhi from Suzumiya Haruhi no Yūutsu. English : Escalators at a Copenhagen Metro station. Holy cross at Skogskyrkogården cemetery in the night of All Saints day, Stockholm, Sweden. English : Holy cross at Skogskyrkogården cemetery in the night of All Saints day, Stockholm, Sweden. Mosquito larvæ of the genus Culex. English : Mosquito larvæ of the genus Culex.